John Sant'Ambrogio has enjoyed an illustrious career as a cellist in top orchestras, chamber music ensembles and as a pedagogue for over five decades. 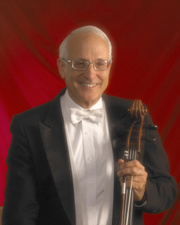 Appointed Principal Cello of the Saint Louis Symphony Orchestra (SLSO) in 1968 after being a member of the Boston Symphony Orchestra for nine years, Mr. Sant'Ambrogio has served as Principal Cello of such orchestras as the Casals Festival (Puerto Rico), Grand Teton Music Festival (WY), Lancaster Festival (OH) and the Seventh Army Symphony (Europe). In 1987, he founded and was the first Artistic Director of Strings in the Mountains. His discography includes chamber music and orchestral recordings on the TELARC, RCA, IMG and VOX labels. Mr. Sant'Ambrogio studied with Leonard Rose, Paul Olevsky and Diran Alexanian and has passed on these pedagogies while on the faculties of Washington University, the St. Louis Conservatory and Boston University. His students have won jobs in major symphony orchestras including the Boston Symphony Orchestra, the Chicago Symphony and the Saint Louis Symphony Orchestra. Retiring from the SLSO in 2005, he moved to Steamboat Springs, CO to pursue his love of skiing, hiking, cycling and photography. Still a very active chamber musician and teacher, he founded the Generations Piano Trio in 2005 with violinist Dmitri Pogorelov and pianist Judith Lynn Stillman. Mr. Sant'Ambrogio continues to perform throughout the country with his trio and, to his delight, with his daughters Stephanie, violinist, and Sara, cellist. Co-Director and Co-Founder of Red Fox Music Camp and Music Festival, New Marlboro, Mass. 1949-79. Founder and Director of the St. Ambrose Chamber Orchestra, 1992 to present. Founder and Director of Arts for the Soul, Seminar/Retreat in Steamboat Springs, CO. 2002 to present. Former pupils have won positions in major symphony orchestras including Boston Symphony, Chicago Symphony and the St. Louis Symphony. Clarinet Quintets of Mozart & Brahms on VOX label. More than 20 recordings with the Saint Louis Symphony on TELARC, RCA, IMG and VOX. Produced two recordings for Strings in the Mountains: The Eroica Trio and Giles Pap & The Country Mountain Boys.